The much-heralded 1951 release of Walt Disney’s Alice in Wonderland became a collector’s bonanza that includes these RCA Victor records that were the closest thing to experiencing the movie in the decades before home video. Released in 1951. Producer: Steven R. Carlin. Film Adaptation: Winston Hibler. Musical Direction: Norman Leyden. Vocal Direction: Jimmy Leyden. Sound Effects: Ralph Curtis. Illustrations: Mel Crawford. Running Time: 18 minutes. Voices: Kathryn Beaumont (Alice); Ed Wynn (Mad Hatter); Jerry Colonna (March Hare); Sterling Holloway (Cheshire Cat); Glenn Riggs (Narrator); Arnold Stang (White Rabbit); Jackson Beck (Doorknob, Tweedle Dum); J. Pat O’Malley (Tweedle Dee); Frank Milano (Dodo); Naomi Lewis (Caterpillar); Jan Tyroler (Queen of Hearts). Imagine an oversized Big Golden Book with a heavy shellac 78 rpm record tucked into the inside covers and you’ll have an idea of the scope of this, perhaps the most elaborate book and record package of its day. Like so many adaptations of this kind, the production moves at a fast clip, with Kathryn Beaumont sounding out of breath at times. The only song presented in full is “In a World of My Own,” while the other songs get only a few bars each, but of course, all of this had to fit into four segments of less than four minutes each. Even though RCA released the records, they were licensed and produced in cooperation with Disney, right down to the script by Disney story artist (and narrator of the True-Life Adventures) Winston Hibler. Steve Carlin, later the executive producer of TV’s The Mighty Hercules (with “iron in his thighs”), produced Alice and many other kids’ records for RCA. Some dialogue most likely was recorded in New York, based on the presence of Jackson Beck, Frank Milano and other New York actors, while that of Holloway, Wynn, Colonna and Beaumont was likely done in LA. When this album was released on LP, it was slightly edited, pieced together and paired with Disney’s Peter Pan. 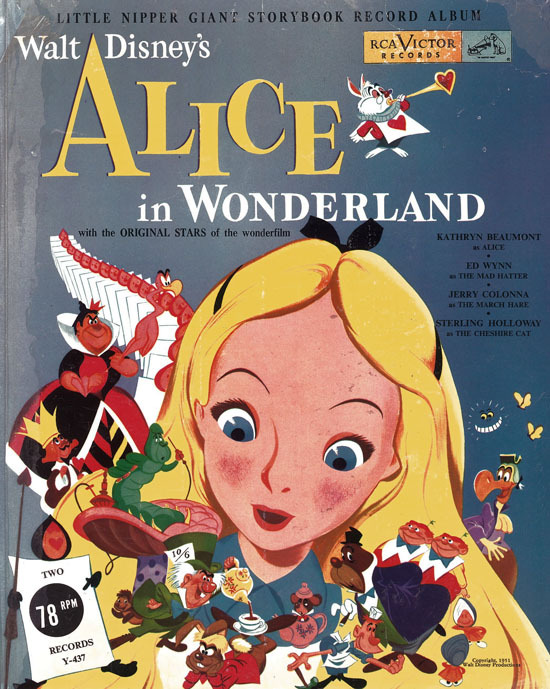 Unlike other RCA/Disney LP’s with Disney character art, this particular LP depicts a generic, non-Disney Peter Pan and no Alice images at all. To add running time to the LP, several additional renditions of Alice and Peter songs by Joe Reisman’s Chorus and Orchestra were also included. My suggestion when seeking out the LP is too look for the early mono “CAL” release, as the later mono and simulated stereo versions have reverb added. What was neat about having this album during the baby boom era was that it was the only one with so many of the original cast members of Alice in Wonderland. Disneyland Records released the superb (but non-soundtrack) Camarata/Darlene Gillespie LP in 1957, but it wasn’t until 1988 that the full score from the soundtrack was released on CD (Thank you, Randy Thornton!). As an example of how the Storybook Album differed from the three single records, you can hear variations in script, character and music. 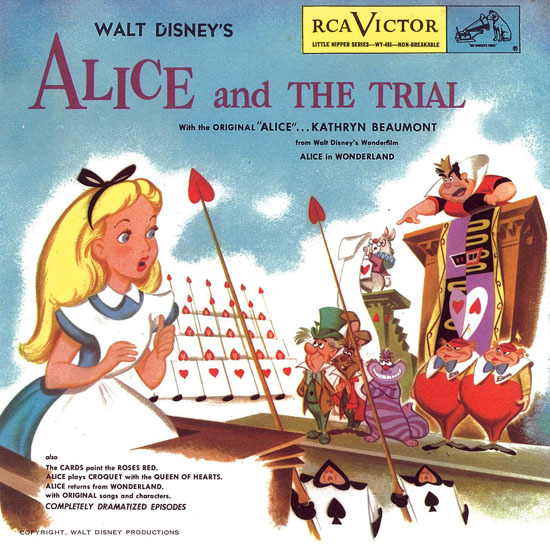 Alice’s sister appears only on the single, and for some reason, Kathryn Beaumont pronounces the word “says” differently on each of the versions. Album Released in 1951. Producer: Steven R. Carlin. Film Adaptation: Winston Hibler. Musical Direction: Norman Leyden. Vocal Direction: Jimmy Leyden. Sound Effects: Ralph Curtis. Illustrations: Mel Crawford. Running Time: 8 minutes each record. Voices: Kathryn Beaumont (Alice); Todd Russell (Narrator); Arnold Stang (White Rabbit); Betty Jane Tyler (Alice’s Sister); Naomi Lewis (Caterpillar, Flowers); Jackson Beck (Doorknob, Tweedle Dum, Card); Betty Garde (Queen of Hearts); Frank Milano (Dodo, March Hare, Card); Michael King (Tweedle Dee, Card); Merrill Joels (Cheshire Cat, Card, King of Hearts); Three Beaus and a Peep. 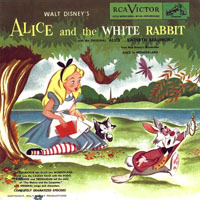 As part of the 1951 Alice in Wonderland marketing and merchandise blitz, RCA also released three separate single records that divided the film story into sections, much like Golden Books did with other Disney films. They are stand-alone productions, not edited from the above two-record set. 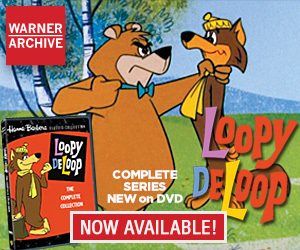 The cast is largely different; with veteran voice actors either resuming some roles they played on the album or filling in for Ed Wynn, Jerry Colonna and Sterling Holloway. Not only does the cast vary, so does the script, which expands on some scenes. 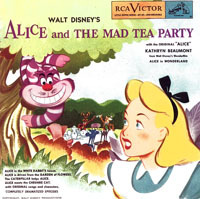 Alice and the Mad Tea Party also includes “We’ll Smoke the Blighter Out” and the White Rabbit’s house sequence, both of which are not heard on the storybook album. The individual records came in illustrated sleeves that open to a double page of pictures and text. Fans of Jackie Gleason’s Honeymooners might want to seek out Alice and the Trial to hear Betty Garde as the Queen of Hearts. A seasoned radio and TV pro, Garde stole the scenes from Gleason and Art Carney as Thelma the maid (“You keep ringin’ that thing and you’ll get one lump!”) in the episode, “A Woman’s Work is Never Done” (good gosh!). Part of the impetus behind these products was due to the whims of RCA honcho David Sarnoff, according to Disney music exec Jimmy Johnson (in his bio Inside the Whimsy Works). After 12” long playing records were developed by Columbia in 1948, Sarnoff created a VHS/Beta situation Rather than making LP’s the standard, had to have his own lemon lollipop. He had his RCA techs create the 45 rpm record, the idea being that listeners could stack them and enjoy the same playing time as an LP. The listener could, to a degree, also select the order and mix of the records, set the changer and relax (a form of “programming” that was a little less convenient with LP’s and would come to fruition with mp3 players). RCA marketed 45’s as the alternative to LP’s, advertising them on their radio network, NBC. On an episode of The Phil Harris and Alice Faye Show, guest star Edward G. Robinson helps promote the 7” discs, remarking about how they could easily fit into one’s pocket (if you happen to be wearing Fred Mertz-sized pants). When RCA Victor sponsored the landmark TV show, Burr Tillstrom’s Kukla, Fran & Ollie, the cast did live commercials for RCA radios, phonographs and records. Some of the records featured Fran Allison and her beloved puppet friends in addition to Disney and Howdy Doody stories. (Walt with Tillstrom at right). 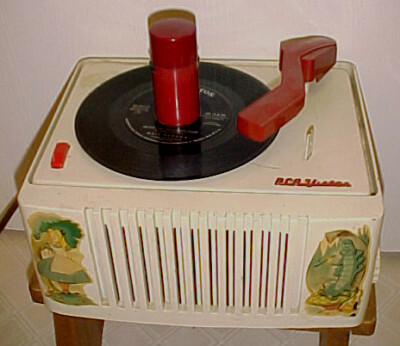 Walt Disney’s Alice in Wonderland was such a big deal at the time, the film was among the properties RCA turned into themed children’s 45 rpm record players with automatic changers (pictured below). Eventually, the public chose LP records for long-format albums, making the boxed and stacked 45 rpm record sets virtually obsolete. Singles became the format of choice for teen pop music. This is a combination of two audio clips from the middle and ending of a TV broadcast you can see on Volume One of the DVD series, Kukla, Fran & Ollie: The First Episodes (There are three volumes in the DVD series, all highly recommended.) The announcer is Hugh Downs. 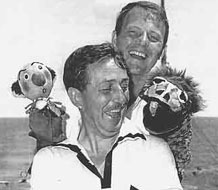 Listen for Kukla’s mention of their meeting with Walt Disney on a recent Transatlantic cruise. Ah, the Alice in Wonderland record player! Grew up with that thing. It still exists and my brother has had it restored at least once. thanks for the history/origin of the rca 45 record player. It was compact, portable, fun/easy to use, and reasonably priced. Also, MUCH thanks for mentioning kukla fran and ollie’s roles in advertising this product and its records. The kuklapolitans did a wonderful job of promoting this and other rca devices. There are quite a few examples of their ads for rca products on the kukla fran and ollie dvd collections. I’m pretty sure alice in wonderland was among their ads (one of the best promotions they did was an entire show devoted to the release of “Carmen” on both 78 and 45. there were many laugh out loud moments on that episode). And while we’re on the subject, volume 3 of kukla fran and ollie was recently released on dvd (I orderd mine a few days ago). If you haven’t ordered these dvds you’re missing out; this is among the finest television series ever made. Steve Carlin involved with “The Mighty Hercules”? I associate that show with Joe Oriolo. I associate Steve Carlin with “The $64,000 Question” and “The $64,000 Challenge”, two of the shows that were very much involved in the Quiz Show Scandals of the late 1950’s. Later, he tried to produce a revival, “The $128,000 Question”–that was in the middle 1970’s, and it flopped! I was looking at some promotional material for RCA’s 45s from the 1948 launch a while back, and the impression I got was that they had been mainly developed as a better 78 and not so much as a response to Columbia’s LP project. Smaller, more durable, but still one three or four minute song per side. If you want to hear more than one tune at a time, stack ’em up on a record-player with a changer, a technique pioneered with 78s. (I once spent an afternoon in the college library listening to an hours-long opera recorded on ’78s. Every few minutes, the record changed, interrupting the music with a whoosh plop. Not entirely enjoyable.) Multi-disc sets were sold as books with interior sleeves for the records, hence the term “album” for collections of songs. 78s had been sold this way, and one of the selling points of 45s was that album collections weren’t as mammoth as 78 albums had been. Later, the term “album” seems to have settled on the long-play one-disc collection of songs itself, but originally it was the book set. There was also a gimmick of color-coding the 45s: black for popular, green for country, orange for R&B, red for classical, and yellow for kiddie. I remember yellow kiddie records from my youth but I don’t think the rest of the color scheme lasted long. My further impression is that the long-play 12-inch 33-rpm record was developed at the same time, also with the idea of replacing the 78, but with a different approach. When the 7-inch and 12-inch formats went head to head in the marketplace, it was expected that one or the other would win out, not both. I don’t think it was anticipated at the time of the launch that they would find separate niches, with the 7-incher ideal for pop singles and an appeal to teenagers on a budget, and the 12-incher for collections. Shellac 78s were fragile, about like china dinner plates. A lot of old movies show records being smashed in ways that I found puzzling watching them as a kid, since I was used to vinyl 33s that didn’t shatter (you could break them but it took some work). In particular I recall a cartoon set in a demonstration “house of the future” in which the automatic record changer has gone berserk and the gloved robot hand is throwing records across the room where they smash against the wall. RCA’s promotional material might not have been as forthcoming about the real reason they developed the 45 rpm record. The account of Sarnoff’s demand for a format to compete directly with LPs comes from Jimmy Johnson’s memoirs, and he was in the music business at the time, interacting with peers and getting the story more directly. David Quantick also reported this as the reason behind 45 records on a BBC radio documentary about single records.